Functional & modern alternative to the conventional one, suitable for holding perfume, mouthwash or other items. This sturdy shower shelf is wide enough for holding various items, offers more shelf space in a small bathroom. Solid SUS304 stainless steel construction with thick frosted tempered glass for durability, rust & scratch resistance. This storage shelf looks classy and simple on the wall, easy to keep clean, helps clear up your counter space. Including mounting hardware for easy installation, no more splashing on bottles or other stuff, easy to reach. PROVIDES ADDITIONAL STORAGE: this modern and classy double tier bathroom shelf provides an elegant solution for holding toiletries, perfume, lotions, tissue box, shampoo, hand towels or other stuff. 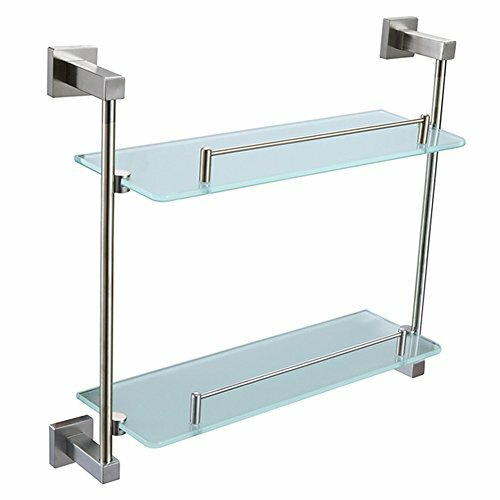 PREMIUM MATERIAL & SOLID CONSTRUCTION: this 2 tier bathroom shelf is solidly made of SUS304 stainless steel with tempered glass for durability, smooth brushed nickel finish for resisting rust and tarnishing. KEEPS THINGS FROM FALLING OFF: the front bar is designed to keep things from sliding off, the rounded corners of the thick glass are made to prevent safety hazards. GREAT SIZE FOR BATHROOM: versatile glass shelf is a great addition to your bathroom or kitchen without taking up much room, coordinating well with your bathroom fixtures. EASY TO CLEAN & EASY TO ASSEMBLE: package comes with mounting hardware for easy installation. This double glass shelf is easy to clean with a soft damp cloth. Dimension(L*W*H): 16.54" x 5.12" x 15.75"(420 x 130 x 400mm).